DSC_0022.JPG, originally uploaded by michael_jecks. 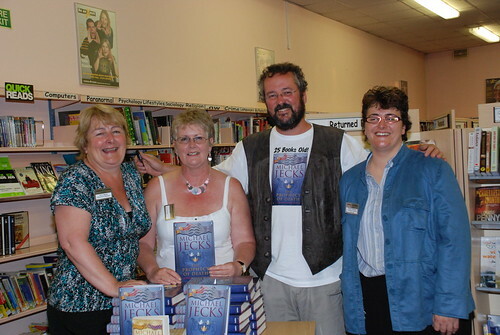 Thurrock’s Belhus Library last night, and a wonderful evening it was, too (for me, anyway). I got out of the office for a few hours, and was provided with an audience who apparently wanted to listen to me. One lady even came all the way from Great Yarmouth to listen. They were on holiday there – they live in Perth, Western Australia, though, and booked their tickets from there. So if there are any other antipodeans out there, keep an eye on the website when you’re sorting out your holidays in the UK! Many thanks to the fabulous team at Thurrock. Jenny, Annette and Rachel. One expert crisp-sprinkler, one expert cook, and one poor soul who’s going to have to nip out and buy a new camera and bag shortly! This entry was posted on Wednesday, July 23rd, 2008 at 8:45 am	and is filed under Dartmoor. You can follow any responses to this entry through the RSS 2.0 feed. Both comments and pings are currently closed.